A ten-day long ice skating and hockey coaching camp organized by Ladakh Women Ice-Hockey Foundation (LWIHF) was concluded on January 11 at Gupuks. A total of 120 girls below the age of 18 years from all parts of Leh district participated in the coaching camp. The camp was divided into Basic, Intermediate, and Advance. Dr. Sonam Dawa CEC, Leh was the chief guest and Avny Lavasa, DC, Leh was the guest of honor on the occasion. 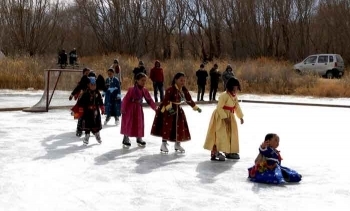 Dr. Sonam Dawa CEC, Leh said, “It is a proud moment for the people of Ladakh that our young women are representing India at international level and today they are conducting ice hockey coaching free of cost for children of Ladakh”. He further said, “I have taken up with the concerned authority of India to include ice hockey in the Sports Authority of India so that we get more help and support to develop this sport". He promised to allot a land for the construction of Ice Hockey rink within the area of Leh city soon and also assured support from Hill Council to accomplish this project. He also donated one lakh for the LWIHF. An exhibition match between new trainees and SECMOL B team was playing. Giving an overview about LWIHF and its initiatives, Kunzes Angmo, President LWIHF said, “All the member of LWIHF are students and have played speed skating, figure and ice hockey at international level and are gold, silver and bronze medalist. Now we are striving to shape our younger to become perfect in ice hockey that could become professional and could represent in Asian level match. Keeping in mind the financial constraint of many, we organize this camp free of cost so that no one will be left behind because of monetary reason". “We get equipment from our generous donor from Switzerland, Singapore, New Zealand, Thailand, Philippines etc because of which we are able to conduct such camps for these children”, she said. She donated a sum of one lakh for the LWIFH. At the end, mementos and prizes were distributed among the players.